Jack Roush released a new package for the Mustang GT dubbed the 2011 ROUSH 5XR Mustang, and it packs a massive punch in form of 525 hp. The engine upgrade which includes the factory-installed ROUSHcharger adds a healthy 113 hp to the output of the car’s V8 engine (412 hp). 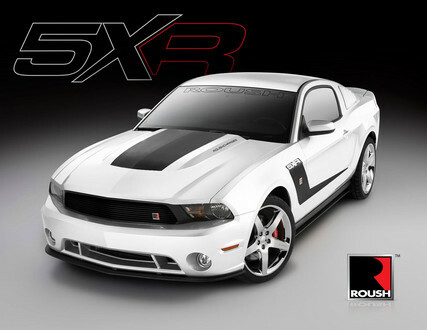 They also offer ROUSH suspension kit, including front struts, rear shocks and rear springs, front and rear stabilizer bars, an exhaust with square tips that gives the 2011 ROUSH 5XR Mustang a deep, throaty sound, and ROUSH body kit and graphics.